2 weeks ago I tried my best at the Fis World Championships in Switzerland but didn't succeed. Even though the kicker was good and the conditions were almost perfect I didn't ride good enough. I didn't qualify for the finals. Bummer. Las weekend I competed again in the the world cup in Torino, Italy. After a long day of riding a difficult ramp with a bumpy landing I got 3rd. 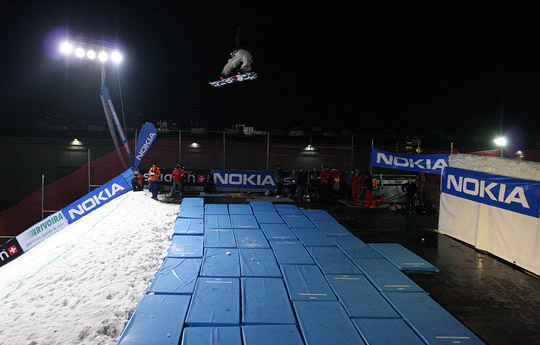 I was up against 3 Finish snowboarders in the finals. In the end the landing hill got smoother and I think some high level snowboarding was shown. The best trick of the day did Peettu Piiroinen with a cab 1080. But in the end it was Janne Korpi who won. I was super happy with my riding and of course with the result as well. The crowd was great in Torino and also very motivating. Back home after pizza, lasagna and tiramisu.